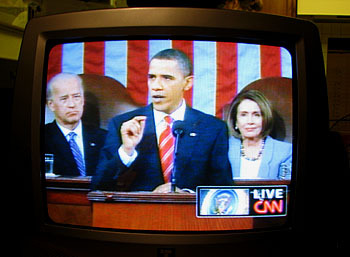 The chatter on CNN is all about Obama tweaking the State of the Union address right up until the last second. This makes me nervous. He really ought to have a firmer idea of what he wants to say by now. But I suppose it really doesn’t mean anything. For me, it’s all about healthcare. The whole speech rises or falls on that one issue. So on with the show. Wrapup – I’m not really much of a SOTU connoisseur, and I was focused almost completely on healthcare in this one. On that front, I’d give Obama a B-. Starting off the speech with jobs and the economy made sense, but at the very least I was hoping that the healthcare section would stand out a bit from the rest. But I don’t think it did. Obama never really explained what the current bills do except in the very broadest sense, and even at that he only hit a couple of points. I’m just not sure that was enough. He also declined to say what he wanted Congress to do next. I didn’t want some big wonky explanation of reconciliation and so forth, but I really wished he’d at least said something about the fact that we have a bill in place right now and then urged the House to pass that bill and the Senate to agree to changes. Maybe that just wasn’t in the cards in a speech like this. But I was still hoping for more. I wanted to hear him act like the leader of his party on healthcare, and I’m not sure he did. As for the rest of the speech, it was generally good, but not spectacular. There was a good balance between blaming Republicans for past problems and holding out an olive branch to work together in the future, but I doubt that it will have much effect. It might have played well at home, though. I was also a little surprised that it was so focused on domestic issues. I expected that, but I didn’t expect national security to be practically a toss off. And finally, one big prop: Obama did clearly call for a repeal of the ban on gays in the military. “This year, I will work with Congress and our military to finally repeal the law that denies gay Americans the right to serve the country they love because of who they are.” Good for him. That’s a campaign promise that it’s time to keep. 10:20 – And that’s a wrap. 10:16 – Obama takes on TV pundits who “reduce serious debates into silly arguments.” Nice. 10:15 – And now for the inspirational wrapup…..
10:13 – Firm declaration that he wants to repeal DADT this year. Good. 10:03 – “If the Republican leadership is going to insist that sixty votes in the Senate are required to do any business at all in this town, then the responsibility to govern is now yours as well. Just saying no to everything may be good short-term politics, but it’s not leadership.” OK, that’s better. 10:01 – “Neither party should obstruct every single bill just because they can.” Good line, but do listeners at home all know what he’s talking about? Ditto for overuse of holds on appointments. 9:59 – Yeah, yeah, earmarks. I guess earkmark bashing polls well, but I’m pretty tired of it. 9:57 – Takes on Citizens United decision by warning about possible influence of foreign corporation. Probably a pretty effective approach. 9:55 – Spending freeze won’t take effect until next year. “That’s how budgeting works.” Got laughs, but it wasn’t supposed to be a laugh line. 9:49 – That’s it for healthcare. Seemed a little bloodless to me. Didn’t really explain his plan very well, and never stood up for anything more specific than “Let us find a way to come together and finish the job for the American people.” I was hoping for more, but maybe I expect too much. 9:47 – After a year of healthcare horsetrading, Americans wondering “what’s in it for me?” It would be great to answer this, but he doesn’t, really. 9:44 – Finally, healthcare reform 40 minutes in. But it gets a big round of applause from Dems. 9:42 – “No one should go broke because they chose to go to college.” I get it, but that’s really a strange thing to say. 9:36 – Interesting that Obama keeps giving the House lots of props and urging the Senate to follow suit. Good strategy to show solidarity with House members who feel unappreciated? 9:35 – Nukes get a big round of applause. Ditto for offshore drilling. Something for everyone! 9:34 – Wants “real reform” of financial sector. But what is real reform? He doesn’t say. 9:33 – “I do not accept second place for the United States of America.” Kind of empty, but it probably works. I approve. 9:30 – Bush years were a “lost decade.” Ouch. 9:29 – Obama asks Senate to pass jobs bill, but doesn’t say they should pass one as big as House bill. He should have. 9:22 – Impromptu joke about lack of Republican applause for tax cuts. Good idea? I say yes! Not sure everyone at home got it, though. 9:19 – Rich Lowry on Twitter: “never mentions that the “we” addressing fincial crisis included bush admin.” Well, he just did. 9:15 – Obama says we’re all wondering why bad behavior on Wall Street is rewarded. He’s right. So what’s the answer? 9:14 – “Experts across the political spectrum warned….” How convincing is that as a marker of the depth of our recession? 9:08 – Tim Geithner seemed to be getting some extra special presidential love on the walk toward the podium. 9:05 – Waiting for Obama…..